It snowed the other day so I pulled The Long Winter by Laura Ingalls Wilder off my shelf. Obviously. It is the book I think of when I think of a winter story. When I was a child I was fascinated by the idea of twisting hay into sticks to burn in the stove, by snowstorms so deep they had to tunnel their way to the barn, and by Cap Garland and Almanzo Wilder's expedition to find wheat for the starving town. No matter how bad our winter is it will never be as bad as the one the Ingalls family lived through. The worst that will happen is that I will be stuck at home for a day or so, curled up on the couch with a stack of books by my side. And honestly, that sounds blissful. 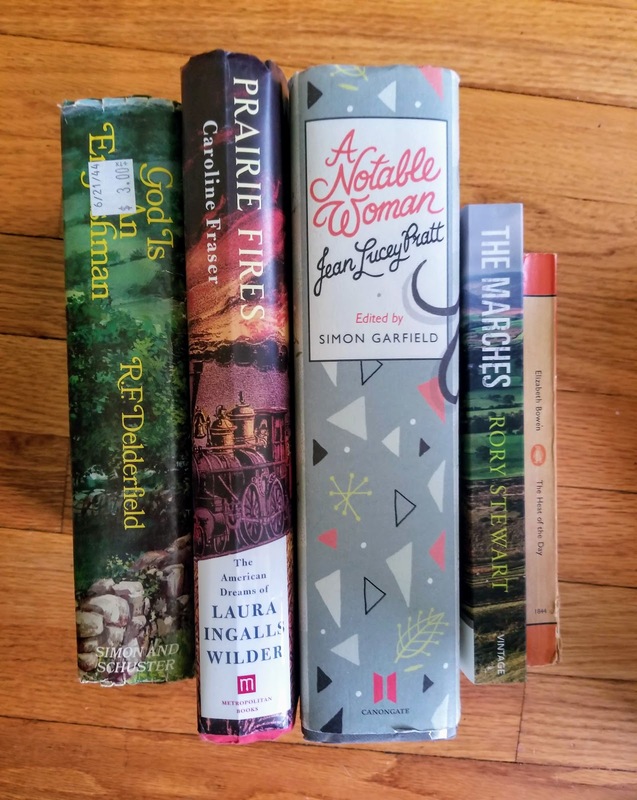 I browsed through my shelves yesterday trying to pick my next book and pulled a pile of books off that I would like to read over the next little while. Winter is the perfect time to read big, fat books that require a little more dedication. Rather than driving "Little House" fans to distraction by diminishing or disparaging the literature they treasure, Fraser declares her respect and affection for it. As the "most unnerving, original, and profound of all her books," Fraser declares, "'Little House on the Prairie' endures as a classic work." "The Long Winter," in Fraser's judgement, was "Wilder's hard-won, mature masterpiece in which expertise accumulated over a long apprenticeship was paying off. I said winter is the perfect time for big, fat books and A Notable Woman: The romantic journals of Jean Lucey Pratt definitely qualifies as a big, fat book. I love reading diaries and this is described as "a unique slice of living breathing British history and a revealing private chronicle of life in the twentieth century." Jean wrote over a million words over the course of her life and no one knew until after her death. Don't you wonder about who else is a secret diarist who has written gripping accounts of their own lives that no one ever reads? The Heat of the Day by Elizabeth Bowen is one of those books I have been saving for just the right time. I have read nothing but rave reviews of it. It is supposed to perfectly capture the atmosphere of London during the Blitz and is regularly referenced as one of the great wartime novels. It sounds like it should be absolutely perfect for me and I am almost afraid to read it in case it isn't as good as I expect. A cold winter's day can be the perfect time to sink into a family saga and R.F. Delderfield is so good at family sagas. I have read a few of his books now and have been caught up in every one. God is an Englishman is the first in a trilogy about the Swann family. Adam Swann is "the scion of an army family, who has seen active service in the Crimea and India, and who determines to make his fortune and found his own dynasty in the ruthless world of Victorian commerce." I don't own the third book in this series and I probably should buy it right away. I know once I start the first one I am just going to want to keep going. The last book in my stack is The Marches: Border Walks With My Father by Rory Stewart. This is an account of the 600-mile long journey Rory Stewart and his father took along the Marches--the border between England and Scotland. It seems to be about relationships, history, and the landscape. It sounds like the perfect thing to read when it is too cold outside to do anything. I can sit on the couch, sip tea, and pretend I am getting exercise. I have about 25 pages left in the book I am currently reading which is An Open Book: Coming of Age in the Heartland by Michael Dirda. This is about his life, reading and personal, instead of being specifically about books but I am enjoying it. As usual, I am left feeling singularly uneducated but anything Dirda writes has that effect on me. One of his chapter headings is a quote by Henry James. I liked it so I am sticking it in this post. Remember that every life is a special problem, which is not yours but another's; and content yourself with the terrible algebra of your own. Twenty-five pages won't take me very long and I am going to have to pick another book from this list. Any guesses which it will be? The Long Winter is the best. I go through periods when I read that every winter. I wouldn't be too sure about never having to endure a bad winter. One winter we (in Maryland) lost power for a week because of a winter storm. The temperature went down to 45 degrees indoors. This year I heard people in the NY area were stuck on their commutes for hours and hours because of a snowstorm. God Is an Englishman! I read that when I was a teenager and loved it, but I haven't thought about it in years. I love The Long Winter. I know we could get bad weather but I am hoping it won't be that bad! Though a few years ago we had so much snow roofs were collapsing everywhere. I am hoping for a mild winter this year. I love snow days, tea, and books! I'm guessing you'll start the Delderfield next. I think that is next. I read A Notable Woman first. I intend to read that RF Delderfield series too, but as yet I don't have any of the books. Thanks for mentioning The Marches book as I hadn't heard of it. I would like to walk Hadrian's Wall - sometime. We were in that area today, but the rain was chucking it down so we didn't even stop, just drove on home, north of Edinburgh. I would like to walk Hadrian's Wall too but I think you are more likely to do it than I am! If you do, take lots of photos and write a blog post about it please. What a wonderful selection! Dirda is always a joy and Delderfield is such fun to sink into. The Swann books are all huge so once you go in you can stay with them for a while, which is the perfect treat for winter. And as for The Marches, I simply can't praise it enough. It is the most beautiful, affectionate love letter to a parent I've ever read, as well as being a fascinating look at the history of the border land between Scotland and England. I hope you enjoy them all! It is good to hear your recommend The Marches so highly. It was an impulse purchase when I was on vacation in London last year and I knew nothing about it. I lose all moderation when I am in bookstores in the U.K. So many books I have never seen before!